The first objective of most any large wind turbine blade design project is to get to the lightest weight possible. At NASA Langley Research Center, where I helped develop the code that later became HyperSizer, designs for spacecraft that include composites also have a zero failure-tolerance. Those projects must strike a critical balance between low weight and high strength. The same is true in the wind-power industry. Weight is of tremendous importance when designing wind-turbine blades because a lighter blade uses less material, it is easier to manufacture and transport, and has lower fatigue loads (tweet this). Current utility-scale turbines are equipped with blades that range from 40 m (130 ft) to 90-m (300 ft) diameters. But there are prototype and concept blades on drawing boards that approach a staggering 145-m (475 ft) diameters. Design engineering issues such as structural strength, fatigue performance, buckling stability, blade stiffness, wing-tip deflection, and twist limits become increasingly important as turbine blades get longer. In simple terms, a blade must be as light as possible but stiff enough to maintain its aerodynamic shape and durable enough to carry wind loads without material failure. Furthermore, large blades must have a proper distribution of weight and stiffness to avoid instabilities produced by aeroelastic loads (tweet this). 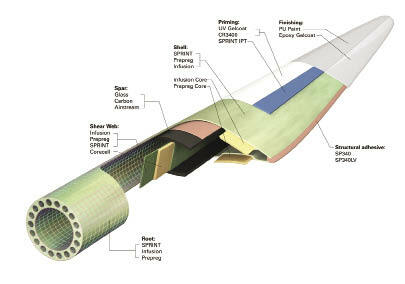 How is a wind Turbine rotor blade is constructed with regards to materials used? My brother and I are in the proto type stages of building a hybrid home electric generating unit. We have our own blade design but are now looking for blades that are very light and durable. Can you assist in our proto type building stages?